Everyone loves moving day, right? It’s a calm quiet time to reflect on the memories of the past, all the plans you made and remade, the excitement of the future, and what opportunities lie ahead! Moving day is never chaotic or confusing and the weather always cooperates. Well, if that’s how your moving days go then I am a very jealous librarian because that is not how our moving day (really a week) went. 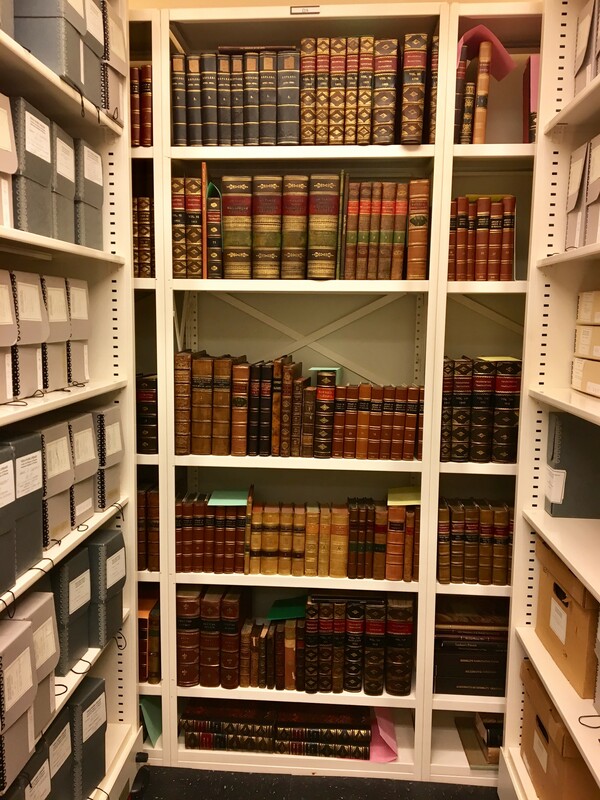 We’ve been planning for the acquisition and arrival of this amazing collection of rare materials for over two years so the week itself felt pretty surreal. 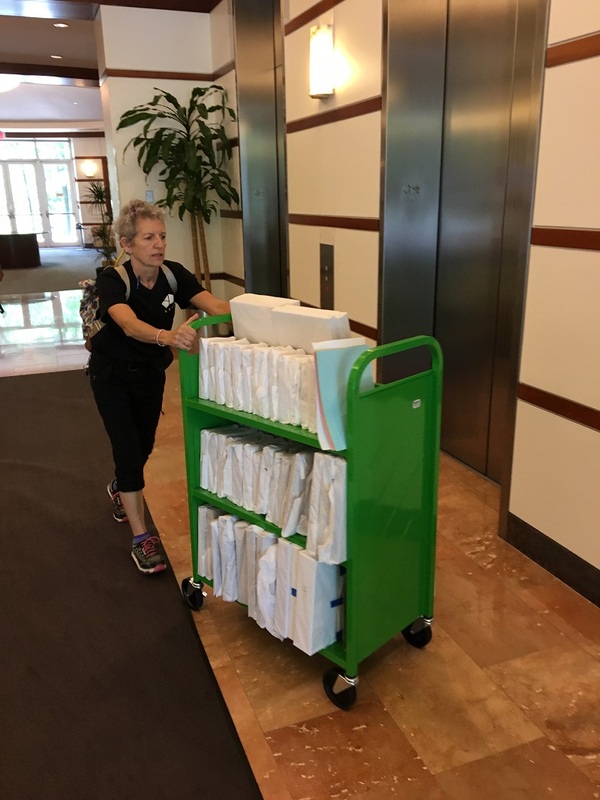 In order to ensure the safety of all these books and journals, we hired a team of qualified art movers to pack and transport all the materials from Florida to Maryland.Two guys and a truck would definitely not be sufficient for the almost 4,000 items that needed to be moved. Melanie Mueller, the Director of the Niels Bohr Library & Archives, and I flew down to Florida to supervise the move. We hoped for clear skies and cool weather. We got neither. Florida, just like Maryland, was experiencing daily downpours. Luckily, it seemed like there would be a clear window on the second day to load the truck. 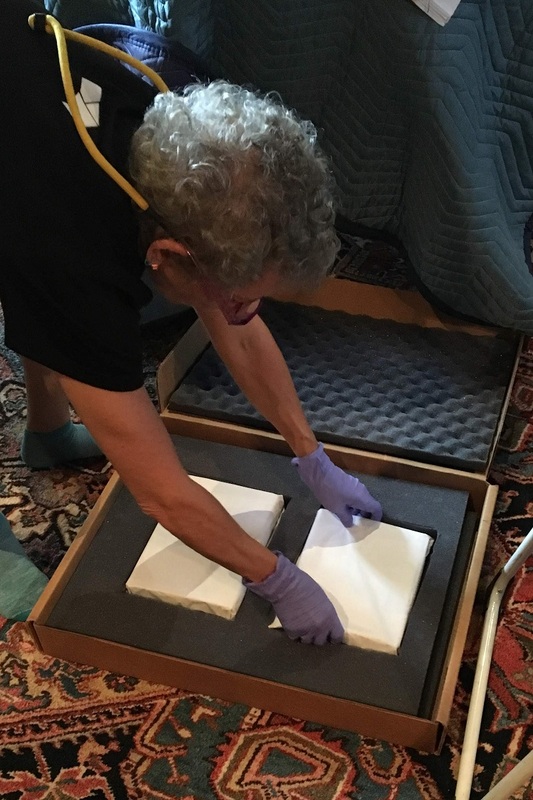 So the first day was spent carefully wrapping and packing up the materials at the collector’s house. The rarest books even got custom-made enclosures! The movers labeled all the shelves and boxes so we could recreate the collector’s original organizational system on our shelves in Maryland. The next day we met at the storage facility bright and early and started packing up the books and publications there. Melanie and I spent the morning putting together boxes because a) it feels good to be useful and b) there wasn’t much else to do except sit on the dusty warehouse floor. They got the truck packed up with the entire contents of the storage facility by lunchtime and after a quick break we met back up at the collector’s house. Now that there was a break in the rain, two of the movers started moving boxes out through the window and into the truck, while the other two movers finished packing up inside. We left for the airport just as the last boxes were being moved out. Our journey home was a lot faster than the books’ because we got to fly. The books got to road-trip up to Maryland in a temperature and humidity controlled truck. Two days after the books were packed they arrived in Maryland ready to see their new forever home! Well, almost. 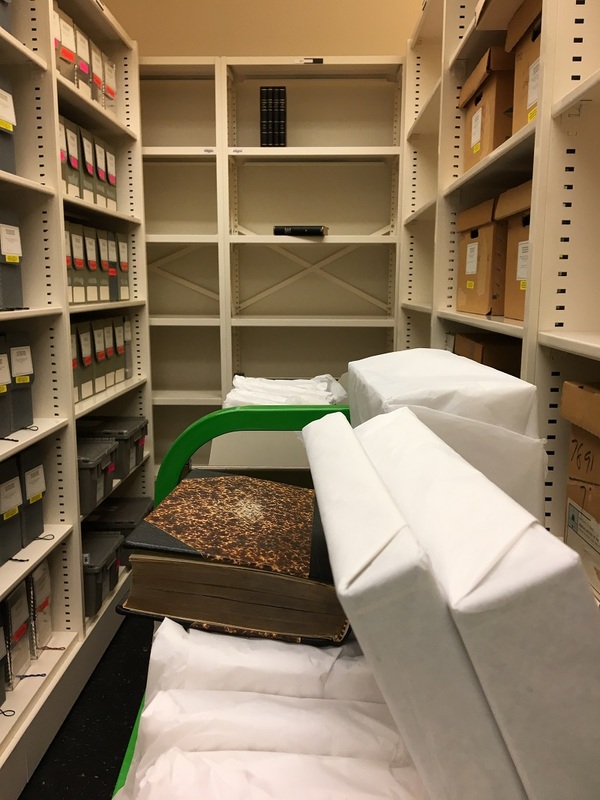 They’re staying with us forever (though technically they are still on loan, like artwork, through the rest of 2018), but they’re temporarily being housed in our Archives stacks while we plan and have a much more robust permanent vault built. There was a lot of excitement at AIP on move in day! The Niels Bohr Library & Archives staff was excited for this long-anticipated event, but so was the rest of the staff. 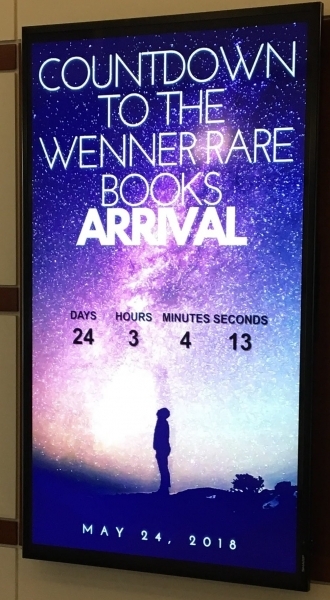 We even had a countdown sign in our lobby. On May 24 we had a camera crew around to film the arrival and there was a buzz the whole day. It felt a bit like graduation day! The movers protected the floor with thermo-ply (like sturdier cardboard) and then the books started rolling in. The movers used one of our conference rooms as a staging area to unpack the boxes and organize all the books. 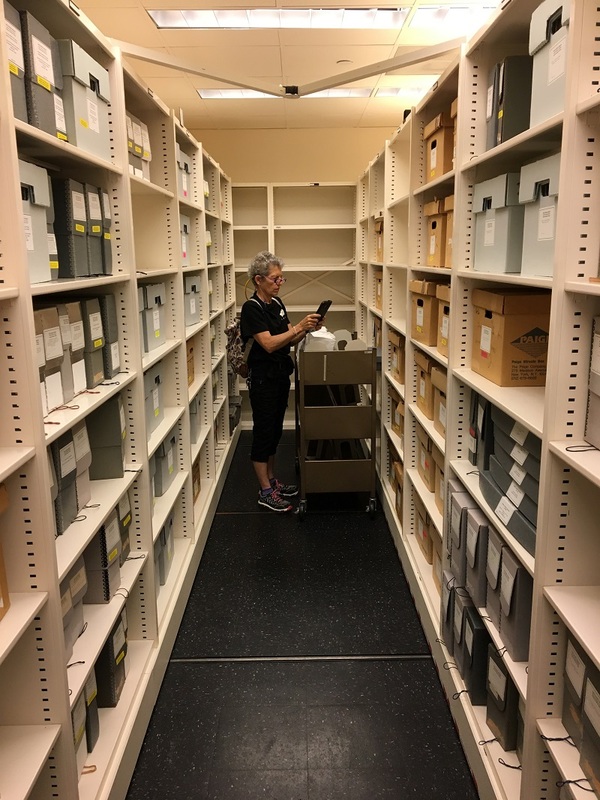 Once the books were unpacked onto the table they could be loaded onto carts and sent via elevator upstairs to the Archives stacks one and two at a time. 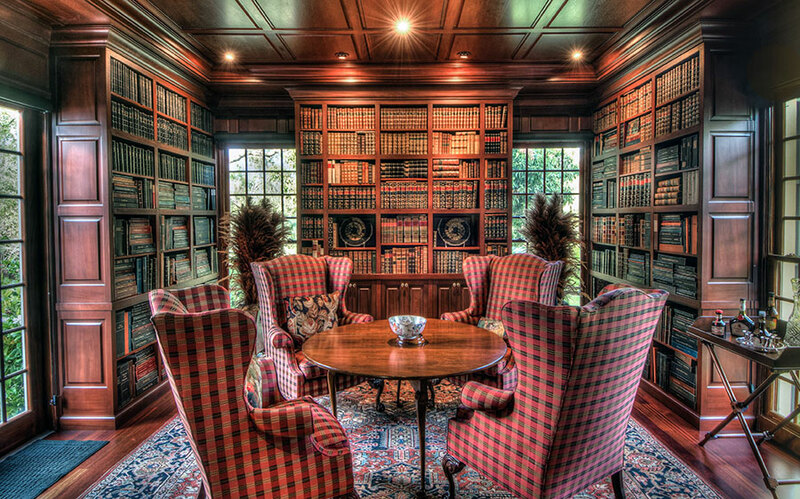 The tight-spaced temporary location for the books only allows access to one or two people at a time, so unloading boxes went faster than putting them on the shelves. But slowly and surely the collection took shape in our stacks. 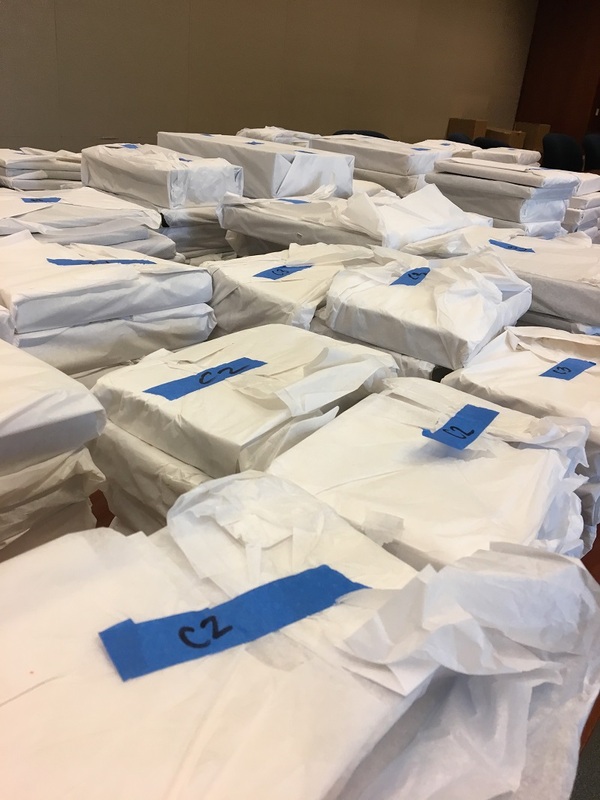 The books from the storage facility were too heavy for one truck, so the second shipment arrived in June with much less fanfare but with a similar process. Now we can begin the exciting work of describing and making the collection accessible. This process will take several years but we’ll be sure to keep you updated on the progress.